How Do You Know Your Message Needs To Evolve? A clear message is the difference between a business that thrives and one that barely survives. Why? Because clarity is what allows your audience to know who you are and how you can help them. But messaging isn’t stagnant. It shifts and grows with us as we shift and grow (as does our business). 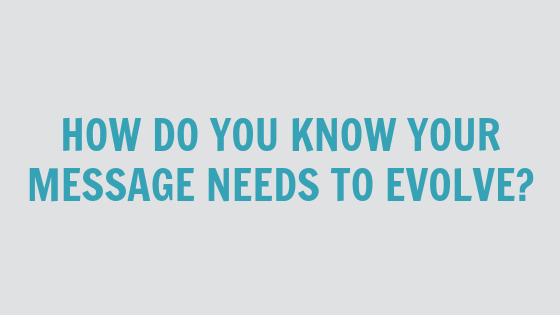 So how do you know if your message needs to evolve? The benefits of evolving your message to match where you are now in your entrepreneurial journey. 00:00 – 1:45: Welcome and Introduction! 1:45 – 5:10: What is an evolved message? 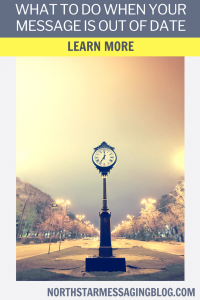 5:10 – 13:05: The signs you need for a more evolved message. 13:05 – 16:00: Benefits of an evolved message. 16;00 – 18:03: How do you evolve your message? You’ve seen rebrands before. A company sheds its old skin and embraces the new. Maybe it’s a logo change. Maybe it’s a new tagline. Maybe it’s a total overhaul. Regardless, this shift marks an evolution in the business. It has shifted beyond what it was. Maybe you’ve experienced this yourself? As business owners, we’re evolving constantly. We grow and learn and make mistakes and have successes. And whether you’re the face of your brand or not, your evolution has an impact on your brand. When we don’t update our message to match our evolution, we end up with a gap between where we are and where our audience assumes we are (because your content is outdated). You have changed or adjusted your services, purpose, audience, etc. The people you work with or the offers you deliver feel outdated, out of sync, or unaligned. Your business model has changed, or your content has naturally shifted over time. You’ve gone through personal changes and transitions that have impacted your business. For example, in our own business we started out writing resumes and cover letters. This worked for us back in 2010 when we were still holding down our full-time jobs. But we quickly outgrew the service, and the business as a whole needed to change into something more representative of our vision for the future. We transitioned into Owl Eyes Creative, a full-service copywriting team. There we stayed until 2015, when we rebranded and became North Star Messaging + Strategy. This rebrand is the result of serving hundreds of clients and completing countless hours of work (both in our business and on our business). We realized we did more than copywriting. We helped our clients gain clarity around their message and feel confident in showcasing it throughout their business. Our most recent shift was to incorporate messaging-driven leadership into the conversation. Again, we realized that the clients we loved serving more than any others were showing up as leaders in their field. So again, we adjusted our message (keeping true to the core of it) to add clarity and stay in line with our evolution. Create on-brand, streamlined content that doesn’t take all your time and energy. If you know it’s time for an upgrade, great! If you’re not sure, think about when you last checked in with your messaging. If it’s been more than six months, it’s probably time. The first step is to take stock of what has changed in the intervening time. Do an audit of your existing messaging, evaluate where you’ve grown, and then determine where to go.